(KERI) Breakfast will never be the same with Megan Gordon on the scene. Famous for her Marge Granola, Megan has knocked eggs ‘n toast right off the counter with the arrival of her new book Whole-Grain Mornings. Who knew whole grains could be so utterly divine? I read the book cover-to-cover, dog-eared my ‘must-try-this,’ and was now ready to roll up my oats and hop-to some pre-dawn cooking. 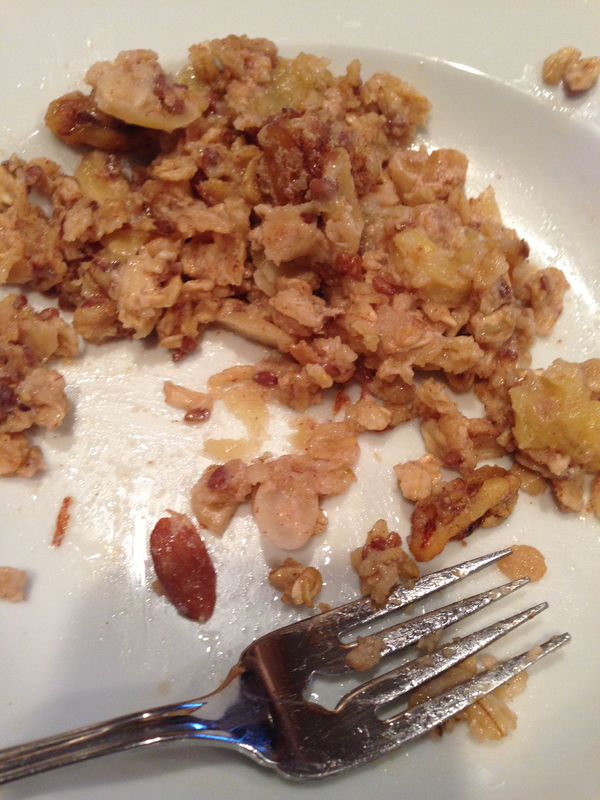 My first test: Baked Banana Walnut Oatmeal. Ohhhhhh yessssss. It seemed to me a breakfast surprise was in order. I mean, with a recipe like this, ingredients like these, you gotta make its debut spectacular. I wanted the aroma of baking oats and bananas to tickle the noses of my two bites. Just like that Folgers commercial. So I chose a Friday. Who would ever suspect a very special baked breakfast on a weekday? Not my Bites. My plan worked perfectly. My little family awoke to a house full of snuggley smells as they stretched and yawned, then perched themselves at the kitchen island with a bowl-full of comfort. Eyes popped, spoons couldn’t stop scraping. Move over eggs, there’s a new girl in town and her name is Baked Banana Walnut. This oatmeal is nothing short of perfect. It’s simple (‘hey, dry ingredients, meet wet ingredients’). The flavors are absolutely on point. It’s like banana bread in a bowl. And guess what? NO refined sugar. Okay….it’s got applesauce and maple syrup, but this is sugar of a better kind. Whole grains. Natural sweetness. It is silly-good and it’s good for you. Marina’s ‘fave’ part? The grains. The grains? Yes, the grains. ‘Great texture, don’tcha think, Mom? !’ Why yes, I do. It’s true. The oatmeal, nuts and flax seeds are a hammock for the creamy bananas and their spice pals Cinnamon, Nutmeg and gorgeous Ginger. Is it morning yet?! I’ve got leftovers calling my name. And tickling my crave buds. Preheat oven to 375F. Grease an 8-inch square baking dish with a little butter, fully coating the bottom and sides. 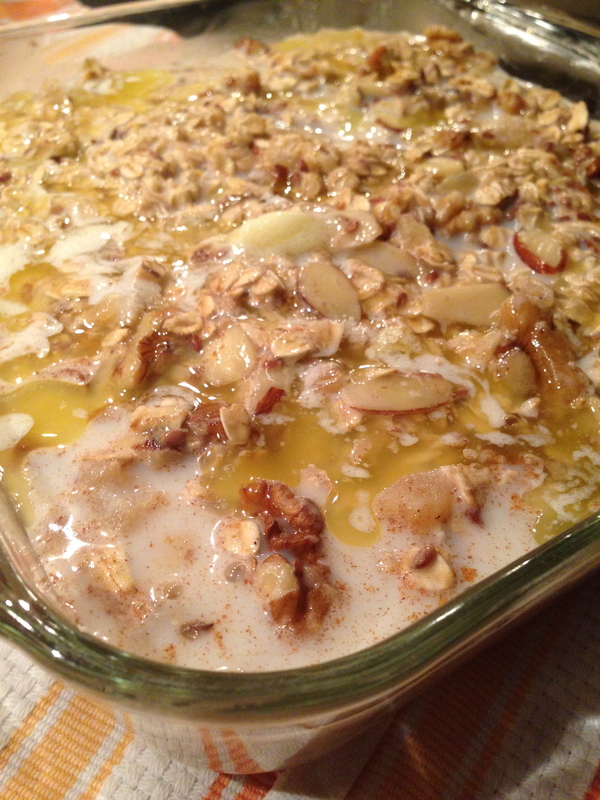 In a large bowl, mix together the oats, almonds, walnuts, flaxseeds, baking powder, cinnamon, ginger, nutmeg and salt. In a medium bowl, whisk together the 1 cup of the milk and the buttermilk, applesauce, maple syrup, egg and vanilla. Add to the oat mixture and fold gently together quickly until just combined. 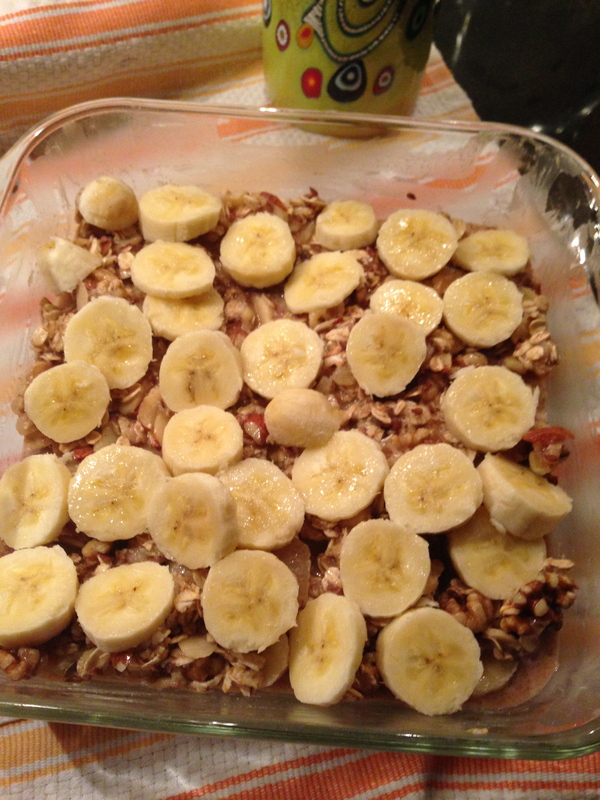 In the prepared baking dish, spread an even layer of sliced bananas (this usually takes 2-3 full bananas). Then evenly spoon half of the oat mixture on top of the bananas. 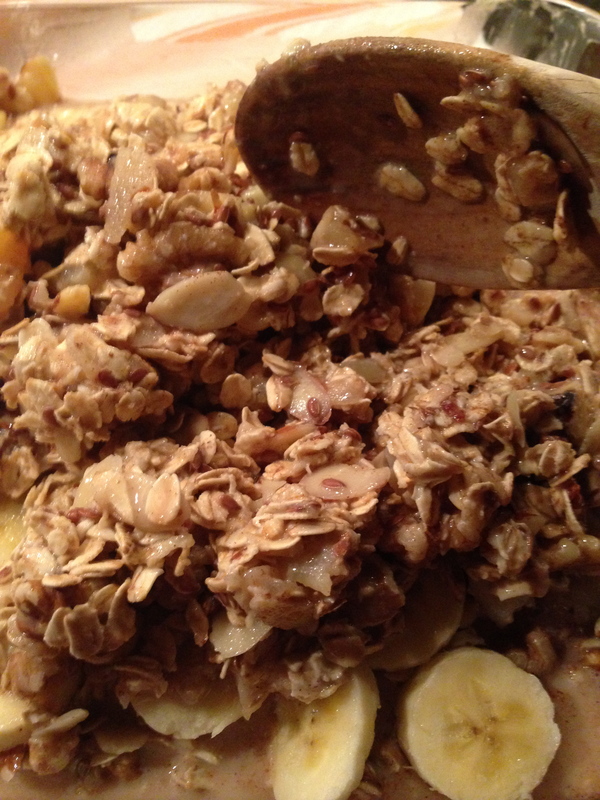 Repeat with remaining bananas, then top with the rest of the oat mixture. Drizzle remaining milk and the 3 tablespoons of melted butter over the top. 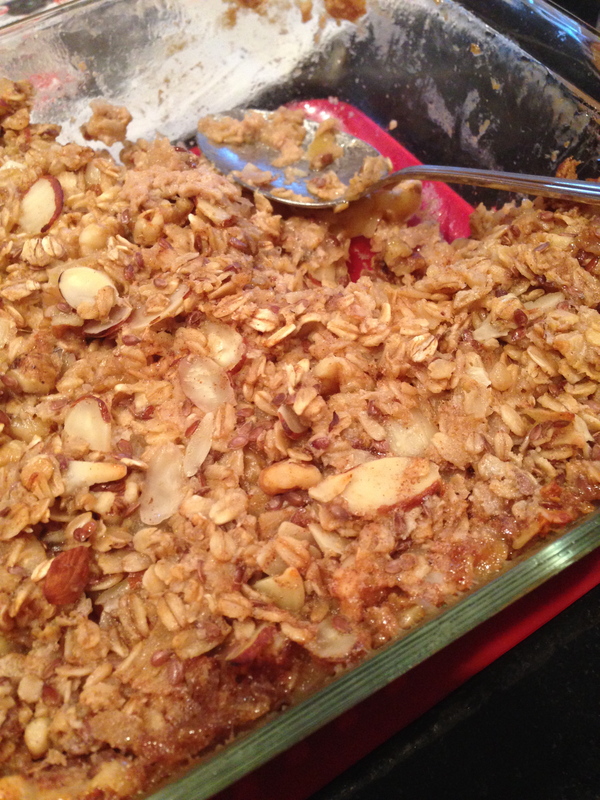 Bake until the oatmeal is bubbling and has a slightly golden top, about 40 minutes. Let cool for at least 15 minutes before serving. Serve warm with a sprinkle of sea salt, drizzle of maple syrup and some cream. Cover and refrigerate leftovers for 4 to 5 days.